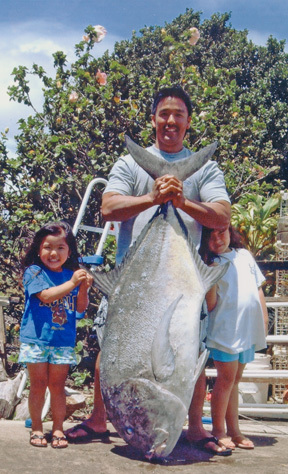 Terence Yogi was fishing with his gang at "The Plank" in the Makena area on Maui when he hooked up on his 13.5-foot Sabre pole. He battled the giant fish using a Penn 4/0 reel and 60-lb test Sufix line for about 45 minutes when it tangled in four other lines. After some frantic work from his buddies, the fish was gaffed and his dream became reality.